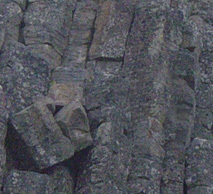 Basalt is used in construction (e.g. as building blocks or in the groundwork), making cobblestones (from columnar basalt) and in making statues. Heating and extruding basalt yields stone wool, an excellent thermal insulator.